Us Brits love our Spag Bol, but once you've tried this authentic Italian version, you'll wonder how they can both be called the same thing. And Italians would never serve this sauce with spaghetti - it has to be tagliatelle. Cut the bacon (or pancetta or gianciale) into small pieces. Place it in a large pot and turn the heat on medium. As the pan heats up, the bacon fat will begin to melt. Stir the bacon and when there is quite a lot of fat add the minced meat. Break it up into tiny pieces and let them cook for about 5-10 minutes, stirring occasionally. The meat will release moisture, and when this has all evaporated, tip the meat out into a bowl. While the meat is cooking, prep the veg. Peel and finely chop the carrot and onion, finely chop the celery. Melt the butter in the same pot you cooked the meat in. Turn the heat down very low and add the onion, carrot and celery. Stir them well to get everything coated in butter, then put a lid on the pot and let the veg sweat for 10 minutes. Add the meat, wine and tomato passata to the vegetables. Stir well and turn the heat up high. Let everything cook for a couple of minutes, then turn the heat right down low, put the lid on the pot and simmer for 3 hours. Stir the ragu from time to time to make sure it doesn't stick. If it begins to look too dry, add a bit of water. When the ragu is cooked, stir in the milk and simmer for another 40 minutes. Add salt and pepper to taste. Toss cooked tagliatelle into the ragu and serve with a crisp green salad and some full-bodied red wine. The video above is from the Keef Cooks YouTube channel. 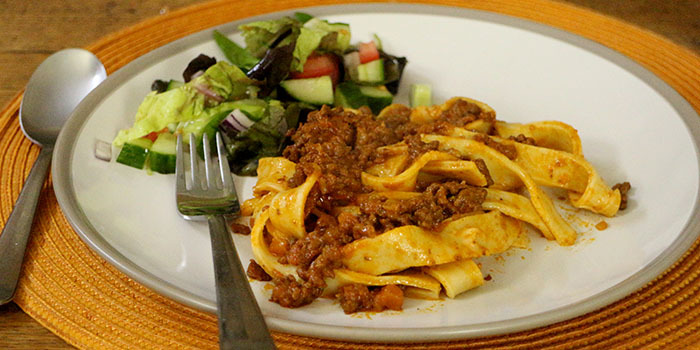 Click here to see the video recipe of Ragu Bolognese on YouTube. Salt and pepper to taste. You can use tomato puree instead of passata - just use half the quantity. And you can use pancetta or gianciale instead of bacon. Total time: 4 hours 15 minutes.